To fill the void in the leisure charter business created by the demise of VIM-Avia last year, Red Wings is to secure five more Airbus А321s from the second-hand market in April and May of this year, Evgeny Klyucharev, general director of the Russian scheduled and charter carrier, has told ATO.ru, Russian Aviation Insider’s sister publication. The Moscow, Domodedovo-based airline received its first western-built aircraft only 11 months ago, and now operates four Airbus A320s and three bigger A321s. The airline also has six Tupolev Tu-204 narrowbodies, aircraft from its original fleet, with two phased out when they exceeded their maximum designed service lifespan. Red Wings, a renowned advocate of Russian-built aircraft, has repeatedly emphasised that the adoption of the Airbus A320 family is merely a transitional move ahead of the hoped-for 2019 arrival of its future workhorse, the MC-21, Russia’s next-generation narrow-body aircraft. In total, Red Wings has ordered 16 of the single-aisle twinjet airliners, which are being developed by the Yakovlev Design Bureau and produced by its parent Irkut, a division of Russia’s United Aircraft Corporation (UAC). Red Wings’ MC-21s are being leased from the Ilyushin Finance Co (IFC) leasing company, which also happens to be the airline’s new owner. “We certainly look forward to the MC-21, as our main mission is to operate Russian aircraft,” director general Klyucharev stresses. The carrier also leases its Tu-204s from IFC. In accordance with a previously signed protocol, some of the MC-21s will be powered by Russian-made engines. With those developments to come, the airline says the favourable operating economics of the A321, and the doubling of the size of its fleet, are the two main reasons for the carrier’s profitability last year. At the same time, falling under the control of IFC has allowed part of its historical debt to be converted into capital. 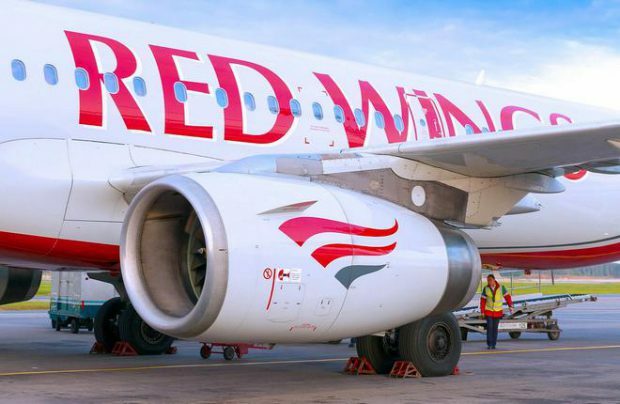 In accordance with its ambitious business plan, Red Wings expects to transport some 2.9 million passengers this year, a remarkable 80 per cent increase on a year earlier, according to Klyucharev. In 2017 its passenger traffic grew by 75.5 per cent, promoting the airline into 12th place in terms of passenger numbers in the biggest Russian airlines league. Red Wings and Nordavia, which operates nine ageing Boeing 737-500s, have been cooperating for some time, sharing their route networks, fleets, and distribution channels. The stakeholders in both Russian carriers – Red Wings (owned by lessor Ilyushin Finance Co, via its subsidiary Airline Asset Management) and Nordavia (owned by investment company Sky Invest) – declared their decision to merge their assets into a single aviation holding structure last October. The parties are anticipating that the aim of the merger is to consolidate business and improve the carriers’ joint financial stability, which would allow for substantial fleet modernisation, the development of a synergistic route network, and an overall increase in operational efficiencies, thereby creating a new ‘power player’, one to break into the top 10 of the country’s airlines.